The current competitive business environment is rapidly changing. Human resource is the main key to the business in recent years. In today’s retail business, the role of store leader is very important because the retail store performance is determined by a store leader. Unfortunately, some store leaders do not have the right mindset when running their job. The concept of intrapreneurship is to transform the personal initiative, innovative behaviour, and managerial skills into an individual performance. This framework of intrapreneurial mindset is expected to answer the gap in an empirical situation. The aim of this qualitative research is to construct the theoretical model by analyzing data inductively in the grounded theory approach. It utilizes interviews, observation and document analysis. Twenty-five individuals in a bicycle retail chain store in Indonesia were interviewed as theoretic samples. The result of research findings is the consistency of retail store leader who has an intrapreneurial mindset will always involve the team and work for mutual achievement that prioritizes company's objective. It is useful for retail business practitioners to assign individual as a retail store leader. In addition, it also provides some suggestions to employees to improve their performance in business. Intrapreneurial Mindset, Personal Initiative, Innovative Behaviour, Managerial Skills. The stiffness of business competition in the global economic climate requires companies to keep high performance to compete and grow (Budihardjo, 2014). Business changing occurs very fast and dynamic. This situation sends a message to business organizations in the 21st century to get ready for changes. Companies that cannot control their business will be out of the competition. Responsive business organizations will be the winners of changes, while reactive business organizations will be the victims of changes. Human resource is the most important thing in a company to face changes. The function of human resource management has been changed. In the past, human resource management merely acts as a unit related to the employee salary administration, employee attendance control, enforces company rules; engage in recruitment, selection, training, promotion and dismissal. Currently, human resource management plays a strategic role in developing the core competencies of the company and achieving a sustainable competitive advantage through people. Every company in business needs new innovative ideas to create a unique position and survive beneficially and therefore, it has to find ways and means to tap the potential intrinsic in its employees (Rekha et al., 2015). The employees have an important role in human resource management in a business organization (Hartono, 2010; Mitsakis, 2014). In the retail business, store employees are very important resources and affecting the store performance. Human resource at a retail store is related to product management, customer service and store operations. The retail business performance is determined by their retail stores as a frontline of the business. Each store directly interacts with consumers. A retail store is led by store leader, who as a store supervisor/manager. Its performance is generally measured by sales achievement, sales growth and stock turn-over. The performance is made up of Retail People (sales team management), Retail Product (merchandising management) and Retail Process (store operation management). Meanwhile, the traditional retail business focuses only on the stores and operational activities to provide the right products at the right price and sell it at the right time. In fact, the performance of the store leader is one of the keys that can improve the retail business performance. To get maximum performance, retail store leaders need to act as an entrepreneur when leading a store. Unfortunately, retailers realized the difficultness having retail store leaders who work wholeheartedly and manage the store like their own business. An employee is currently working only in his own way (Wibowo, 2016). Even though, retail store leader works depend on the mindset. There is no change without a changing mindset (Tan, 2002). Retail store leaders do not have the initiative to manage the store optimally or innovation to handle retail store operational matters. Retail store leaders who are weak in managerial skills are difficult to increase the store business performance. The difference between the facts obtained from the empirical data and expectations in theoretical data becomes a factual condition as the research problem. The focus of this research is the intrapreneurial mindset of retail store leader. This focus is selected because of the urgency to improve the individual performance that affects the organization performance, particularly in a retail business. There are three related factors and contribute to constructing the main focus of research: (1) personal initiative, (2) innovative behaviour and (3) managerial skills. These three factors are the sub focus of this research. Refer to the focus and sub focus of the research, there are three associative research questions as references to construct the model in social condition studied: (1) how the personal initiative of retail store leader worth in intrapreneurial mindset?, (2) how the innovative behaviour of retail store leader engage in intrapreneurial mindset?, and (3) how the managerial skill of retail store leader support the intrapreneurial mindset? By using symmetrical, causal, or interactive relationships from these research questions, this research construct theory for formulating the way for personal initiative worth in intrapreneurial mindset, innovative behaviours engage in intrapreneurial mindset, and managerial skill supports intrapreneurial mindset. Mindset is a belief or a way of thinking that affects behaviour and attitude of a person who ultimately determines the success rate of his/her life (Waluyo, 2009; Dweck, 2017). Mindset is the way the brain and the mind accept process, analyze, perceive, and make inferences to the incoming information through our senses (Yunus, 2014). Mindset is a structural thinking process, involved in a combination of existing resources to deal with problems and create opportunities, effective thinking, and cognitive adaptation (Pasaribu, 2016). Mindset is a state of mind that influences the way one thinks, feel, and acts in any situation (Tan, 2002). One’s mindset reflects personally distinguishable attitudes, beliefs and values, which influence one’s ability to learn and lead, and to achieve and contribute (Buchanan & Kern, 2017). Mindset is the most important at the individual level beside attitudes, behaviours and capacities (Ilayaraja, 2015). In each profession or type of work, there are special characteristics that affect the mindset of the people involved. However, an entrepreneurial environment not only inspires employees to innovate, it also motivates them to develop an entrepreneurial mindset, one that is needed to innovate (Tseng & Tseng, 2016). Intrapreneurship or Corporate Entrepreneurship was initiated by Susbauer in 1973 with an understanding of entrepreneurship within the organization. Although the company does not belong to employees personally, an employee works as an entrepreneur who runs the own business. However, the notion of corporate entrepreneurship was developed and recognized by a lot of organizations through a book written by Gifford Pinchot entitled “Intrapreneuring” in 1985 describing the terms “intra” and “entrepreneurship”. Pinchot suggests and provides guidance to individuals to initiate and develop ideas to be transformed into a business venture. In addition, Pinchot states that intrapreneur is a goal-oriented and self-motivated person. Intrapreneurship popularized by Gifford Pinchot increasingly develops tailored to the goals and conditions of an increasingly dynamic organization. It relates to the organization’s needs to strengthen its business. Intrapreneurship is the spirit of entrepreneurship within the employees working in an established organization (Rekha et al., 2015). Intrapreneurs are a valuable company asset because they have an optimistic outlook, responsibility, taking calculated risks, rewarding the feedback and always looking for new opportunities (Winarno, 2011). Intrapreneurship supports organization to survive in competition with its competitive advantage because intrapreneurs drive the positive performance for the company (Amir, 2016). However, intrapreneurship must begin by changing the mindset of employees because intrapreneurship is more as a spirit and mindset, not a career path (Amir, 2016). Dhewanto (2013) states that in the current business conditions, big companies encourage their employees to have the passion and knowledge to be readily accepting the challenge of intrapreneurship. In a competitive business environment, besides creative strategies, human resources must have high competitive values, such as: creative and innovative, high commitment, intrapreneurial, and motivated to learn continuously (Budihardjo, 2014). Sathe (2003) stated six reasons why intrapreneurship determine the success of the company, are: (1) intrapreneurship overcomes uncertainty that cannot be controlled normally; (2) intrapreneurship encourage employee to go beyond a company setting; (3) intrapreneurship supports companies to sustain and grow; (4) intrapreneurship takes opportunities even small; (5) intrapreneurship is being consistent for the long term; and (6) intrapreneurship is a process that can be managed optimally. Intrapreneurship has influences on business performance (Thorén, 2007; Foba & Villiers, 2007; Markovska, 2008; Platzek, 2012; Serinkan et al., 2013; Baruah & Ward, 2014; Aarakit & Kimbugwe, 2015; Hayton, 2015; North, 2015; Rekha, 2015; Enginoglu & Arikan, 2016; Sampath, 2017). However, intrapreneurship is often overlooked because intrapreneurship must face the challenge of being able to recognize opportunities and build new opportunities for the organization. Personal initiative is an individual attitude that actively and voluntarily strives to achieve the goal and ready to handle the problems (Fay & Frese, 2001; Falola et al., 2014; Bernabe et al., 2016; Frese et al., 2016; Glaser et al., 2016; Warner et al., 2017). It defines the behavioural tendency to: (1) self-starting, (2) proactiveness, (3) persistence, and (4) pro-company. Selfstarting implies that individuals are not just waiting to see what others do, but start an action without being told or without an explicit role model. Proactiveness implies a long-term focus which allows individuals to recognize and exploit future opportunities. Persistence is measured when individual overcome barriers in pursuit of a goal. A pro-company orientation must be in accordance with overall organizational goals in the long run. Budihardjo (2014) stated that someone who has the initiative to do the job creatively and innovatively in order to improve the performance of the organization. Individuals will do a beneficial action for the organization more than required, for example: take the initiative to increase the competency and voluntarily take the responsibility. In a retail store, a retail store leader is expected to have personal initiatives to deal with difficulties, complaints, competitions, deviations, crisis, and other difficult situation (Sujana, 2012). Innovative behaviour is part of intrapreneurship in human resource management (Nijenhuis, 2015; Hastuti et al., 2016; Gürsoy & Güven, 2016; Pukienė, 2016; Hecker, 2017; Järvenpää, 2017; McDowell, 2017). Spiegelaere (2014) defined that the innovative behaviour is the action to create and share innovation in an organization to increase individual performance and organization because of a changing of consumer demand. It can be realized from employeedriven innovation. Dorner (2012) argued that innovative behaviour is the most needed factor to face the changing of economic condition and increase the competitive advantage of the company. Patterson et al. (2009) found six supporting factors in innovative behaviour in the organization, are: (1) Cognition, (2) Personality, (3) Motivation, (4) Knowledge, (5) Behaviour, and (6) Emotion. In a retail store, a retail store leader is expected to have innovative behaviour to increase store performance by optimizing store condition, product advantages, and customer characteristic. Guswai (2016) identified two key success factors in retail business innovation, are: (1) operation driven, and (2) merchandise driven. The innovative behaviour of retail store leader is part of operation driven. Managerial skills enhanced the intrapreneurship (Ganeshan, 2016; Reichartz & Weinert, 2016; Aparicio, 2017). It consists of: (1) planning, (2) organizing, (3) leading, and (4) controlling (Daft, 2016; Robbins & Coulter, 2016; Griffin, 2017). Planning is the management function that involves setting goals, establishing strategies for achieving those goals, and developing plans to integrate and coordinate activities. Organizing is the management function that involves arranging and structuring work to accomplish the organization’s goals. Leading is the management function that involves working with and through people to accomplish organizational goals. Controlling is the management function that involves monitoring, comparing, and correcting work performance. In a retail business, a retail store leader has the most essential role in store management, particularly in a decision-making process (Kurnia & Simarmata, 2014). Arnold et al. (2009) stated that a retail store leader responsible for store operational and solve all store problems. A retail store leader must have the sense of belonging to the store, not only just be working in the store (Ariakandi, 2010). A retail store leader manages the integration of product, people, and proses optimally in a dynamic and complexity store management, such as promotion activity planning, working schedule, leading sales team, and inventory control. The qualitative research does not focus on a population and statistical sample, instead of in a social situation. There are place, actor, and activity that interact synergistically. In qualitative research, the researcher is the main instrument who observes a social situation naturally. Data are collected through in-depth interview, direct observation and document analysis then processed in constant comparison and coding systematically as open coding, axial coding, and selective coding (Charmaz, 2006). This research constructs the theoretical model and analysis data inductively based on the qualitative research method in the grounded theory approach. It is more focused on the meaning, rather than general application. Based on the process mentioned, a research process is developed as depicted in Figure 1. This research utilizes interviews, observation and document analysis. Twenty-five individuals were interviewed. This includes store leaders, area managers, and store staffs who work in Rodalink Indonesia, a bicycle retail chain store. Key informants are ten store leaders who served as the theoretic samples in the single social situation of this research, meanwhile, five area managers and ten store staffs are supporting informants. Area manager is superior and store staff is subordinate of key informants. The supporting informants are sources of triangulation data given by key informants. They were chosen through theoretical sampling which assures that these people represent and related to the research context and issues. The interview focuses on three aspects, which are personal initiative, innovative behaviour, and managerial skills. Each transcript of the interview was coded, compares each other, and then analyzed with documents and informants' activities to produce some findings. They reflect social situation reality and apply it practically and theoretically. Data were analyzed based on personal values that refer to corporate vision and mission that translated into business focus and corporate culture. The data is qualitatively analyzed to construct the theory for improving individual performance that supports organizational performance. The data analysis process is shown in Figure 2. By applying grounded theory approach, the findings are generated by constructing the data obtained from informants. Theory/proposition is built through symmetrical relationships, causal, or interactive data that have a number of similar actions to relate and support each other. These similarities, and also differences, are found by comparing data with theory, data with data, theory with data, and theory with theory. This research found that the retail store leader who has an intrapreneurial mindset will always take the initiative to make the best decision independently. He/she make a decision without waiting for orders from superiors, make a decision for solving problem, make decisions on right procedures, make decisions but keep in coordination with their superiors, make decisions by involving his subordinates, make decisions even though constrained distance with headquarters, make decisions by considering self-capacity, make decisions even if they have to sacrifice. The self-starting is triggered by the personal initiative in intrapreneurial mindset. It is beneficial to the organization achievement through the individual performance. This research found that the retail store leader who has an intrapreneurial mindset will be proactive to see, create, and take advantage of the opportunities in order to improve the store performance. It is shown when identifying and leveraging both internal and external opportunities by empowering the team. The personal initiative of a retail store leader becomes a proactiveness to improve the organization performance through both individual and team performance. This research found that the retail store leader who has an intrapreneurial mindset will be able to handle the operational problems and find solutions to overcome them. The persistence of retail store leader based on personal initiative in intrapreneurial mindset is manifested by actively searching for the cause of internal constraints and establishing the best solution in order to operational activities can keep running well and smooth, and actively seek the cause of external constraints and strive to provide the best solution in order to maintain a good impression for the company. The persistence of retail store leaders sometimes needs sacrification, particularly when it has to defend its opinion for the company goodness. This research found that the retail store leader who has an intrapreneurial mindset will always support the company's policy with the appropriate direction and strategy set. The support from retail store leaders, such as: delivering the company's direction and strategy to the team, utilization, and maintenance of company assets, accept the company limitations, build a team that leads in the company direction and strategy, etc. In accordance with the intrapreneurship, the retail store leader will have a mindset as an entrepreneur who works in accordance with the direction and strategy of the company. This research found that the retail store leader who has an intrapreneurial mindset is able to identify the advantages and disadvantages of the store. The retail store leader has an intellectual thinking in accordance with his or her responsibilities. That cognition shapes innovative behaviour on how it works to achieve the best performance for itself that affects team performance and organization performance. This research found that the retail store leader who has an intrapreneurial mindset is able to manage interpersonal relationships and maturity thinking of managing the organization when facing interpersonal conflict. The personality of the retail store leader underlies innovative behaviour to resolve conflicts within the organization. The personality of an intrapreneurialminded retail store leader embodies innovative behaviour in actions, such as managing conflict through a personal approach; managing conflicts in order to maintain harmony in the team's social relationships, manage conflict expressly and quickly, etc. This research found that the intrapreneurial mindset will be reflected in individual attitude when got a failure. Intrapreneurs are motivated to solve the problem because they treat the job as their own. The retail store leader who has an intrapreneurial mindset will take the initiative to do some innovation as the solution to problems. For instance, the retail store leader evaluates the causes of previous failures why sales cannot achieve the target given. It will be shared with all team members and rise together. This research found that the innovative behaviour in intrapreneurial mindset must be supported by the knowledge. The innovative behaviour is seen when the retail store leader aware of lack of knowledge and strives to reduce their shortcomings by exploring knowledge from various sources. The retail store leader who has an intrapreneurial mindset will learn independently in order to increase his or her knowledge by ignoring the organizational hierarchy structure. He/she will sincerely share the knowledge to the team in order to get the best performance together. This research found that the retail store leader who has an intrapreneurial mindset desires to improve own individual performance, such as excellent communication and social interaction, work personality style, networking, etc. This innovation-oriented behaviour is also useful to improve the overall performance of the organization. This research found that the retail store leader who has an intrapreneurial mindset will prioritize honesty in work and has the integrity to the job and company. This emotional intelligence lies behind the innovative behaviour of retail store leaders against the potential and irregularities that occur in the store. The retail store leader will take action in a hurry but firmly to declare a truth. Honesty and transparency are central to creating and maintaining a successful intrapreneurial corporate culture (McGrath, 2016). This research found that the retail store leader who has an intrapreneurial mindset has the managerial skills in work planning. It is done systematically for the short term by utilizing resources owned. He/she will prepare a useful work plan to reduce the weaknesses of the store. The intrapreneurial mindset becomes the basis for the retail store leader to do the planning with achievement motivation. Long-term planning is also done by retail store leaders due to the changes and resources. This research found that the retail store leader who has an intrapreneurial mindset has managerial skills to organize resources optimally. It is done carefully and planned to enable team runs the job. Retail store leader seriously and firmly manages the use of resources according to their potential and needs. This research found that the leadership of a retail store leader who has an intrapreneurial mindset will lead by example. It is shown as follow: leadership starts from self, leadership is to motivate the team, leadership is delivered individually or in groups in accordance with the interests and their respective roles, leadership is realized by serving the team through the direction and award given. This research found that the retail store leader who has an intrapreneurial mindset will control all works and evaluate them for corrective actions. This control is done by documenting work activities in order to ensure the work process that occurred in store. Control of the work process is even done out of working hours as a response to the organization. If there are matters that affect the performance of the store, the retail store leader will control the work process by finding out the subject matter directly. 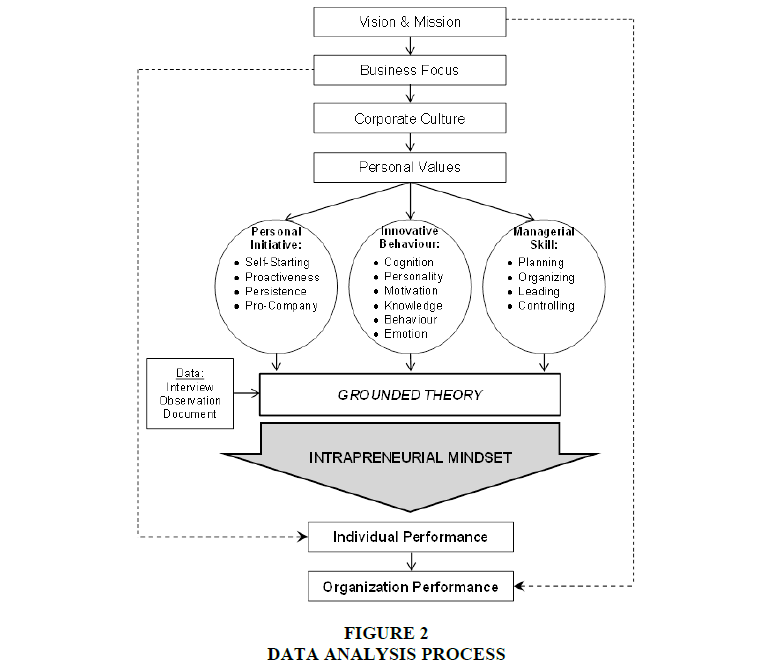 Based on the research findings, the theoretical model of an intrapreneurial mindset is developed as a model in Figure 3. Personal initiative, innovative behaviour, and managerial skills are the frameworks for an intrapreneurial mindset of retail store leader. The retail store leader's personal initiative plays a role in the intrapreneurial mindset when retail store leaders work with (1) the goal of producing high-quality result oriented work, (2) performs the job independently but remains in the rule, and (3) does not dominate a job but always involves team participation and sincere motives to carry out a job. Innovative behaviour engages in the intrapreneurial mindset of a retail store leader if the leader of a retail store (1) has a masterful knowledge so that it can easily be manifested (knowledge-based action), (2) always want to share it with others, they care about others to share the benefits of their work-based innovation (stakeholder-based action), (3) have an open-minded action, and (4) all innovations do in accordance with integrity-based action. Managerial skill shapes the intrapreneurial mindset if it (1) works systematically, (2) manage the resources for optimization, (3) lead by example, and (4) responsible for doing all activities to self, the team, and the company. Document analysis in this research proved that the intrapreneurial mindset of retail store leader produces a pattern of attitudes that shape the pattern of action. The mindset becomes the guideline for retail store leader to know the actions that must do then produce the attitude that is the desire to do so. This attitude further forms the action to make it happen in real action. Direct observation in this research found that the intrapreneurial mindset does not only build individual performance but also build team performance and organization performance. Team involvement in the intrapreneurial mindset results in the team's performance. The achievement orientation that aligns with the strategic policy direction of the company in the intrapreneurial mindset creates the performance of the organization. The Intrapreneurial mindset of retail store leader becomes the basis for individual performance affecting the performance of the retail business which is dynamically growing. Without intrapreneurial mindset, the store leader works merely based on his/her functions and responsibilities or at least merely expecting the rewards of his/her work. Therefore, the constituent elements of the intrapreneurial mindset of a retail store leader are very important to note. The constructed theoretical model is different with models that were developed earlier. It focused on intrapreneurship at an individual level, which is a mindset, not at the organizational level. The model answered the gap in factual conditions, between empirical data and theoretical data. The model of intrapreneurial mindset is followed wishes of the retail business practitioners to have retail store leaders who work wholeheartedly. It is because an employee with intrapreneurial mindset contributes to the business performance in turn to the growth of the organization. This research found out that the consistency of retail store leader who has an intrapreneurial mindset will always involve the team. Some of the activities that will be employed are planning, problem solving, learning, and so on. Another finding is that retail store leaders who have intrapreneurial mindset will work for mutual achievement that prioritizes company's objective. Two attributes, region and gender, do not show any difference from every meaning obtained in research. There is no contradictory meaning among regions. Similarly, there is no contradictory meaning between male and female. This research found similarity meaning in region and gender in intrapreneurial mindset. The theoretical models constructed from this research can be applied by organizations to recruit, develop, and assign a potential candidate as a retail store leader. Some suggestions for retail organization to obtain optimal results by applying the theoretical model, the organization should: (1) creating an intrapreneurial climate and culture in the company, (2) create conflicts that lead to positive competition among employees, (3) accepting the challenge of achieving the employees in all levels according to their capacity, (4) provide facilities and support for skill development, (5) provide opportunities to all employees for being success, (6) encourage employees to implement innovative simple ideas, (7) open for any complaint and suggestions from employees and (8) rewards to anyone who achieves, which does not necessarily always have to be a material thing but can be pride and possibly increases the confidence level of the employees. The intrapreneurial mindset can be developed for each individual when the organization supports the environment. However, the intrapreneurial mindset has several weaknesses. They are (1) the intrapreneurial mindset is possible to be transmitted to others but it may be different, (2) the intrapreneurial mindset is for long-term but it is possible to change because of organizational culture and personal experiences and (3) the intrapreneurial mindset cannot be forced to everyone. The constructed model is a possibility for further researches and development. There are some limitations to this research, so further research is needed to examine the model and produce a more applicable model. Some recommendations for further research are: (1) can involve more key informants and expand the plurality of other retail stores in order to make comparisons between different retail stores, (2) can apply different research methods to obtain new meaning to strengthen the theory built, a quantitative research is possible to measure the influence of each element in the intrapreneurial mindset, (3) use more attributes of informants, such as: educational background, age, work experience, duration of work, etc., which allows new significant findings, (4) expand to other business sectors, such as services and trade and (5) collaborate with other academic fields, such as psychology and sociology, to prepare a scientific tool for measuring an intrapreneurial mindset level. Aarakit, S.M., & Kimbugwe, F.K. (2015). The relationship between intrapreneurial orientation and firm performance. Global Advanced Research Journal of Social Science, 4(1), 6-10. Amir, M.T. (2016). Corporate entrepreneurship & innovation: Melejitkan semangat intrapreneurship di organisasi. Jakarta: Kencana. Aparicio, M.E. (2017). Driving and inhibiting factors for intrapreneurship. Unpublished Master Thesis, Norwegian University of Science and Technology. Ariakandi, I. (2010). Sukses berbisnis ritel. Jakarta: Gramedia Pustaka Utama. Arnold, T.J., Palmatier, R.W., Grewal, D., & Sharma, A. (2009). Understanding retail manager’s role in the sales of products and services. Journal of Retailing, 85(2), 129-144. Baruah, B., & Ward, A. (2015). Metamorphosis of intrapreneurship as an effective organizational strategy. International Entrepreneurship Management Journal, 11(4), 811-822. Bernabé, M., Lisbona, A., Palaci, F.J., & Aragón, M.M. (2016). Social identity and engagement: An exploratory study at university. Journal of Work and Organizational Psychology, 32(4), 103-107. Buchanan, A., & Kern, M.L. (2017). The benefit mindset: The psychology of contribution and everyday leadership. International Journal of Wellbeing, 7(1), 1-11. Budihardjo, A. (2014). Organisasi: Menuju pencapaian kinerja optimum. Jakarta: Prasetiya Mulya. Charmaz, K. (2006). Constructing grounded theory: A practical guide through qualitative analysis. London: Sage Publications. Daft, R.L. (2016). Management (Twelfth Edition). Mason: Thomson Higher Education. Dhewanto, W. (2013). Intrapreneurship: Kewirausahaan korporasi. Bandung: Rekayasa Sains. Dorner, N. (2012). Innovative work behaviour: The roles of employee expectations and effects on job performance. Unpublished Doctoral Dissertation, University of St. Gallen. Dweck, C.S. (2017). Mindset: Changing the way you think to fulfil your potential. London: Robinson. Enginoglu, D., & Arikan, C.L. (2016). Creating a corporate entrepreneurship strategy for competitive advantage. International Review of Economics and Management, 4(1), 14-28. Falola, H.O., Salau, O.P., Olokundun, M.A., Oyafunke-Omoniyi, C.O., Ibidunni, A.S., & Oludayo, O.A. (2018). Employees’ intrapreneurial engagement initiative and its influence on organizational survival. Business: Theory and Practice, 19, 9-16. Fay, D., & Frese, M. (2001). The concept of personal initiative: An overview of validity studies. Human Performance, 14(1), 97-124. Foba, T.W., & Villiers, D.D. (2007). The integration of intrapreneurship into a performance management model. Journal of Human Resources Management, 5(2), 1-8. Frese, M., Hass, L., & Friedrich, C. (2016). Personal initiative training for small business owners. Journal of Business Venturing Insights, 5, 27-36. Ganeshan, A. (2016). Enhancement of intrapreneurs in the growing corporate organizations. International Journal of Research in Management, 6(3), 62-70. Griffin, R.W. (2011). Management (Twelfth Edition). Mason: Cengage Learning. Guswai, C.F. (2016). The teaching of retail guru: Sam Walton. Solo: Tiga Serangkai. Hartono, A. (2010). An investigation into strategic human resources management in Indonesia: A grounded research approach. Unpublished Doctoral Dissertation, Murdoch University. Hayton, J.C. (2015). Promoting corporate entrepreneurship through human resources management practices: A review of empirical research. Human Resources Management Review, 15(1), 21-41. Hecker, A. (2017). The intrapreneurial nature of organizational innovation: Toward a new process model. International Journal of Innovation, 5(3), 375-398. Ilayaraja, S. (2015). Indian educational system and its impact in entrepreneurship as a career. International Journal of Entrepreneurship, 19(1), 29-39. Järvenpää, P. (2017). Fostering intrapreneurship and Innovation through cultural transformation. Unpublished Master Thesis, University of Oulu. Kurnia, A., & Simarmata N. (2014). Intrapreneurship and decision making in modern store management. Jurnal Psikologi Udayana, 1(3), 63-73. Markovska, M. (2008). Intrapreneurship: Way of work in organizations for improvement of working quality. The fifth international scientific conference business and management. McDowell, T.C. (2017). A comprehensive study of intrapreneurship as a cultural form of innovation and sustainable competitive advantage. Unpublished doctoral dissertation, Florida Institute of Technology. McGrath, J. (2016). How to identify intrapreneurs within your company. Mitsakis, F.V. (2014). Human resources as a strategic business partner: Value creation and risk reduction capacity. International Journal of Human Resources Studies, 4(1), 154-170. Nijenhuis, K. (2015). Impact factors for innovative work behavior in the public sector: The case of the Dutch Fire Department. Unpublished Master Thesis, University of Twente. North, J.J. (2015). Individual intrapreneurship in organizations: A new measure of intrapreneurial outcomes. Unpublished doctoral dissertation, University of York. Pasaribu, M. (2016). From the perspective of strategic management: Knowledge, innovation and entrepreneurship. Jakarta: Kepustakaan Populer Gramedia. Patterson, F., Kerrin, M., & Gatto-Roissard, G. (2009). Characteristics & behaviours of innovative people in organizations. Literature review. London: City University. Pinchot, G. (1986). Intrapreneuring: Why you don’t have to leave the corporation to become an entrepreneur. New York: Harper & Row. Platzek, B.P. (2012). The role of intrapreneurship in a globally competitive technology business environment: A design concept and empirical study. Unpublished Doctoral Dissertation, University of Pretoria. Pukienė, A. (2016). Innovative work behaviour: The role of human resource management and affective commitment. Unpublished Master Thesis, ISM University Management and Economics. Reichartz, L., & Weinert, L. (2016). The perceived influences of managerial activities on intrapreneurship: A case study at IBM. Unpublished Master Thesis, Lund University. Rekha, S.K., Ramesh, S., & Jayabharathi, S. (2015). 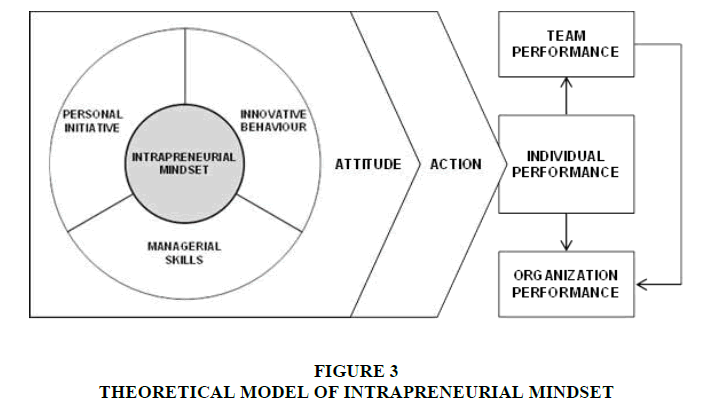 Empherical study on the relationship between entrepreneurial mindset and the factors affecting intrapreneurship: A study in Indian context. International Journal of Entrepreneurship, 19(1), 53-59. Robbins, S.P., & Coulter, M. (2016). Management (Thirteenth Edition). Essex: Pearson Education Limited. Sampath, R. (2017). Exploring organizational change through an understanding of intrapreneurship. Unpublished Doctoral Dissertation, Walden University. Sathe, V. (2003). Corporate entrepreneurship: Top managers and new business creation. Cambridge: Cambridge University Press. Serinkan, C., Kaymakci, K., Arat, G., & Avcik, C. (2013). An empirical study on intrapreneurship: In a service sector in Turkey. Procedia Journal of Social and Behavioural Sciences, 89, 715-719. Spiegelaere, S. (2014). The employment relationship and innovative work Behaviour. Unpublished Doctoral Dissertation, The Katholieke Universiteit Leuven. Sujana, A.S.T. (2012). Manajemen minimarket. Jakarta: Raih Asa Sukses. Tan, V.S.L. (2002). Changing your corporate culture: The key to surviving tough times. Kuala Lumpur: Times Books International. Thorén, K. (2007). Corporate entrepreneurship as business development strategy. Unpublished Doctoral Dissertation, The Royal Institute of Technology. Tseng, C., & Tseng, C.C. (2016). Strategy for increasing innovation at post-IPO firms. International Journal of Entrepreneurship, 20(1), 84-99. Waluyo, M. (2009). Psikologi teknik industri. Yogyakarta: Graha Ilmu. Warner, G.J., Fay, D., & Spörer, N. (2017). Relations among personal initiative and the development of reading strategy knowledge and reading comprehension. Frontline Learning Research, 5(2), 1-23. Winarno. (2011). Pengembangan sikap entrepreneurship dan intrapreneurship. Jakarta: Indeks. Wibowo. (2016). Manajemen perubahan (Third Edition). Jakarta: Rajawali Press. Yunus, S.B. (2014). Mindset revolution: Optimalisasi potensi otak tanpa batas. Yogyakarta: Jogja Bangkit. We offer a federation of 12 allied academies publishing a total of 14 different journals in various fields of business. With an acceptance rate of 30%, each of the journals of our affiliates is double blind, peer reviewed and each is listed in SCOPUS, SCIMAGO, Google Scholar, EBSCO, ProQuest, Cengage Gale, LexisNexis and several other academic databases and search engines. © 2002-2019 Allied Business Academies. All rights reserved.